"I got this recipe from a friend who was living in Ecuador. 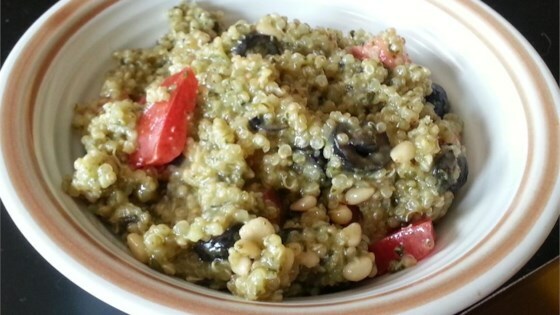 Quinoa was a staple of her diet there; it is a great source of protein." This was deeeeeeelicious. I love pesto, so this was perfect for me. I felt like it needed something else, though... so I added a can of chickpeas and it was great. Quick and easy for a main dish or a side dish. I added sliced carrots at the end with the tomatoes for more color and some crunch. My husband had seconds! More pesto is needed, I doubled the pesto the second time and it was much better.